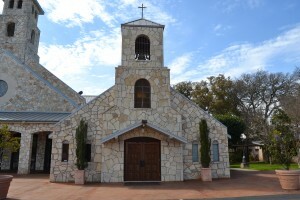 Early records show that the Catholic ministry in Helotes began in 1896 with Mass offered and the Sacraments administered occasionally and in private homes. In 1908 a wooden chapel was constructed on the grounds of what is now the Helotes Catholic Cemetery on Bandera road. The chapel was a simple frame structure that served the community until it burned to the ground in 1924. Once again, Mass was offered and Sacraments were administered in private homes. In 1943, on an acre of land donated to the Catholic Church, with $1,500 donated by the Catholic Extension Society and with the work of Marianists, students from St. Mary’s University, skilled laborers and members of the community, a church was built on the site of the present Eucharistic Chapel. The cornerstone was blessed and laid on Sunday, September 26, 1943. Although unfinished until mid 1944, the church was dedicated on October 24, 1943 and the first Mass was celebrated on the Feast of Our Lady of Guadalupe, December 12, 1943. In 1954 a combination rectory and office building was constructed and the church had its first resident priest. 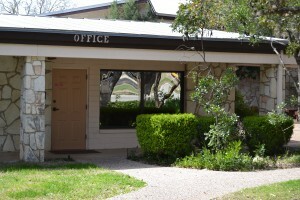 The church continued to grow and in 1964, to meet the needs of members, additional land was purchased and a CCD building was constructed on it to function both as a classroom and a community center. A year later, in 1965, the church (originally built in 1943) was enlarged to double its size and a new entrance, along with a bell tower, was constructed. The year 1967 marked the silver jubilee of the church. This event was commemorated by placing new pews in the church and making alterations in the sanctuary. A year later, on the Feast of Our Lady of Guadalupe, December 12, 1968, the church was raised to the full status of a parish. The Entrance to our Parish Office. By 1976 the parish had grown to approximately 400 families. The old office/rectory was remodeled to become strictly office space. 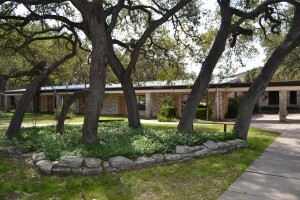 A Parish Family Residence (PFR) was built and dedicated on June 25, 1978. This new residence served as a meeting place for parish organizations, study clubs, prayer groups, a Sunday nursery, as well as being the home for the resident priest. In 1981, with over 700 families in the parish, construction began on a Parish Community Center (PCC) that incorporates within its walls an activity hall, classrooms, meeting rooms, a kitchen and a pantry. The PCC was dedicated on January 31, 1982. At the same time the CCD building, constructed in 1964, was renovated to become the parish office building. With 1989 and a parish of over 950 families came the realization that seating limitations at the Masses prevented some parishioners from being active participants in the liturgies. A decision was then made to build a new church which would incorporate the original church within its boundaries. On September 10, 1989 the beginning of construction was marked by a prayer service with readings from Exodus, Psalms and Hebrews and by the procession of the assembled community carrying its symbols of worship to the Parish Community Center – the temporary place of worship. One year later on October 14, 1990 the new church was dedicated. In May, 2006, after the superiors of the Society of Mary decided to withdraw their commitment to parish ministry here, the parish community gathered to bid farewell to the Marianist community in residence and thank them for their commitment to the parish over the course of decades of faithful service. The Marianist community of Fathers Gerry Hammel and Jerry Pleva and Brother John Rohe relocated to new assignments given to them by their Province superiors. In June, 2006 a new chapter began in the history of Our Lady of Guadalupe Parish with the arrival of diocesan priests. On June 20, 2006 Auxiliary Bishop Thomas Flanagan installed Monsignor Carlos Davalos as pastor and newly ordained Father Jesus Camacho as parochial vicar, both priests of the Archdiocese of San Antonio. 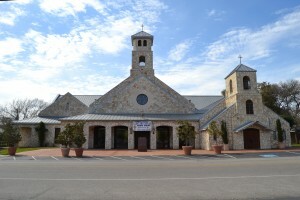 In 2008, Archbishop Jose Gomez re-assigned Father Jesus Camacho to serve as Parish Administrator for St. Joseph in Del Rio. The parish continues to grow rapidly with a current count of over 6,000 registered households, a far cry from the 125 people who celebrated the first Mass on December 12, 1943.